We have a nice little stand of comfrey at the end of our driveway. ðŸŒ¿ Comfrey is ruled by Saturn and it is supposed to be most potent when harvested on Satur(nâ€™s)day during the Saturn hour (either the first or 8th hour of the day, beginning at sunrise). Comfrey is an incredible vulnerary (wound healer) both internally and externally. It is also an astringent (constricts tissues, slows bleeding) and a demulcent (soothes mucus membranes). Saturn rules the bones, as well as lung-related diseases and skin diseases. You can those properties reflected in comfreyâ€™s healing. Comfrey was commonly called â€œbone-knitâ€� because of its affinity for broken bones and itâ€™s astringent properties make it excellent for speedy healing of wounds (note: it heals from the outside in and is especially potent when combine with St. Johnâ€™s Wort, which heals from the inside out). This particular bundle (pictured above) was harvested when the moon was in Pisces and Pisces rules the lymphatic system (and the feet!) so those leaves will end up playing a leading role in an extra potent all-around healing oil & salve. What am I talking about? Medical astrology and astro-herbalism. Have you ever been acquainted with the process of planting and harvesting by the moon? Itâ€™s quite a common practice; even nowadays you can even find information in your trusty Farmerâ€™s Almanac that can be picked up at any grocery or hardware store. Well, astro-herbalism is kind of like planting-by-the-moonâ€¦on steroids. If you want to take your medicine making to the next level, keep reading! My go-to reference book is Cunninghamâ€™s Encyclopedia of Magical Herbs. The list of planetary rulers begins on page 271. That will give you the best day of the week to harvest or work with your plant. 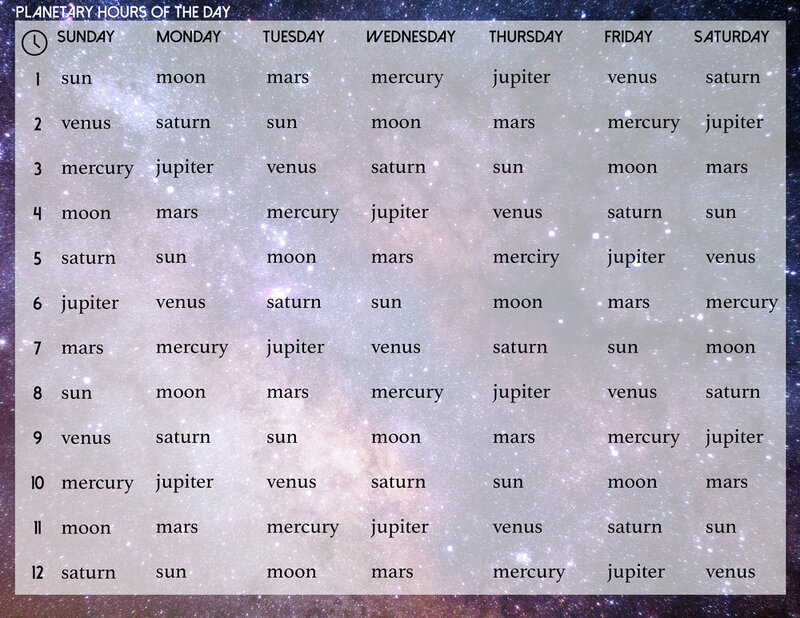 The days of the week are named for the planets, which is somewhat apparent in English but more so in the romance languages. I will use Italian to illustrate because I still remember some from my time living in Italy! If youâ€™re not a morning person and youâ€™re starting to panic at the thought of harvesting plants at literal sunrise, donâ€™t fret. The planetary ruler of the day rules both the 1st and the 8th hour of the day (cue sigh of relief), which means that there will be an energetically potent time to harvest in the middle of the afternoon. Here is a handy-dandy chart of the Planetary Hours of the Day and the Planetary Hours of the Night. You can even download and print these out and stick them on your fridge if you want, they are formatted to print on a standard 8.5x11 sheet of paper. Letâ€™s re-cap: you know what planet rules your plant, you know what day that planet rules, and you know what hour that planet rules. Now before you harvest your plant, thereâ€™s one extra bit of astrological goodness that you can look into before making your herbal preparation: medical astrology. Medical astrology assigns a zodiac sign to parts of the body and/or body systems. You can use this knowledge coupled with astrological timing to harvest plants at the most potent time for the particular preparation or condition that you wish to address. For example, I harvested my comfrey when the moon (ruler of the lymphatic and endocrine systems) was in Pisces and Pisces also rules the lymphatic system and the feet, so knowing that, coupled with my knowledge of the medicinal actions of Comfrey, I might create an oil infusion with my comfrey and turn that into a body oil to use in massage that moves the lymph or a healing foot rub. You can also refer to the astrological positions of the planetary ruler of your plant or the position of the sun. Whatever makes sense to you. I can always quickly check the positions of the planets, sun, and moon using my Llewellynâ€™s Witchesâ€™ Calendar. Medical astrology is an in-depth subject. If you are a clinical herbalist you can use medical astrology to further personalize treatment of individual clients according to their natal chart. To dive in deeper, visit the links or check out the books in the resources list below.